A road car that can go 320 miles per hour? A quad-turbo V16 made from two LS V8s with 5007 horsepower? And all this from a car made by a startup company from Dubai? It all sounds like a joke, I know. Vaporware we shouldn’t give a second glance? Perhaps. But while the Devel Sixteen may very well turn out to be a failure, it’s worth noting a few key facts while keeping an open mind. The concept immediately gets closer to the ground when you learn that its 320 mph target is supposed to be achievable by the “mid-level” 3000 horsepower version of the car, not just the 5007 hp everybody keeps talking about. There’s also the fact that its American-made V16 engine is real, and way more elaborate than you’d imagine. Regarding this latest project, he said “I guess I’m starting to get a reputation among people for taking up crazy challenges.” Then, we had a chat about some huge question marks, standing next to a pair of evolved Sixteen show cars. Oh, and a 6×6 desert monster which is Devel’s idea of a second model. 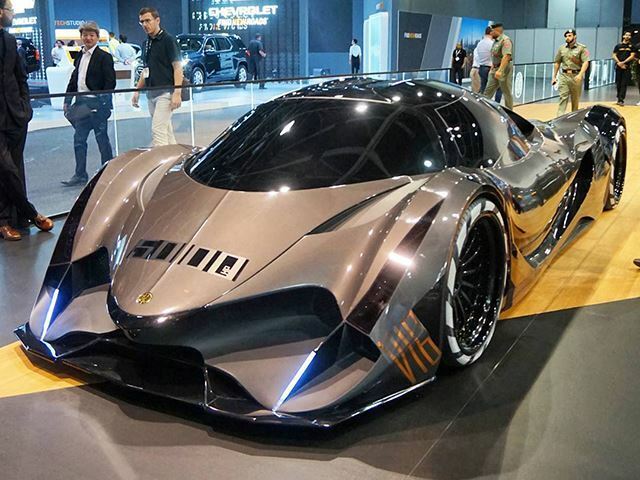 But before all that could happen, Garella just wants to see a working Devel Sixteen prototype in 12 to 14 months from now, designed and built by his company, Manifattura Automobili Torino. The crazy thing is that only in terms of mechanical losses, you have to count with 500 horsepower just for the transmission. For the V8 and the 3000hp V16, we are developing a dual-clutch. For the 5007 horsepower version, we’ll be using a (drag) racing transmission. Basically, what you end up doing is take a standard unit, and you make the gears bigger and stronger. The 5007 hp is more of a dragster, so you’ll be taking spares anyway. As for the road-going 3000hp V16, I think we’ll be in the area of 320 mph. At the moment, that’s exactly what we are doing. We are trying to reduce drag, so that we can reach that speed with 3000 hp. The point of doing the 5007 horsepower version is to offer something crazy for drag racing. There are people looking for these kind of cars. More and more people, especially from this (Middle East) area, who are getting involved in drag racing. The big numbers seem to be the deal.